Mr. and Mrs. Claus were the guest readers for WGS’s December reading night. 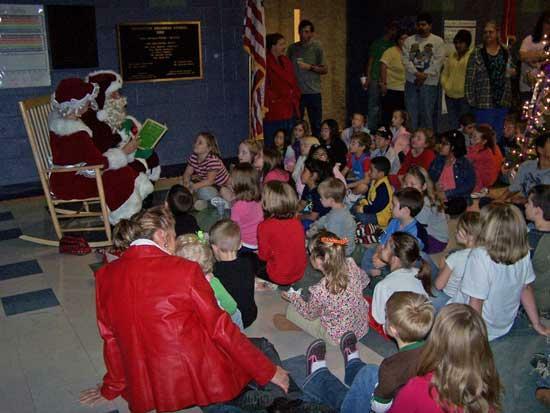 The large crowd enjoyed milk and cookies as they sat around the Christmas tree and listened to the Clauses read. After the story many of the students told Santa want they wanted for Christmas and had their picture taken with the famous couple. Others returned to the library were they read and took Accelerated Reader tests and received double points for their efforts. There was a drawing for four cash door prizes. Only students were eligible to win (sorry parents). The winners were Dalton Greene- kindergarten, Emily Beaty – 4th grade, Shelby Fuqua – 3rd grade, and Ian DeArmond – 2nd grade. A great time was had by all that attended. We hope everyone will return on February 22nd. Our guest reader will be Shan Burklow. She is the illustrator of the Quacker series written by Ricky Van Shelton. She has recently written her own book. She will be sharing books with us and showing the students how to draw illustrations. We are very excited about her visit and hope to get her to autograph our books.